I wanted to take this opportunity to thank you for your personalized service during my recent recuperation. I needed daily help for a period of over two months and the caregivers were professional and caring. After a short while, you were able to send me the same person almost every day. She was wonderful, was always on time, dressed appropriately, anticipated my needs and helped me with activities of daily living. Light housecleaning was done as well as some meal preparations (friends provided most of my dinners). She drove me to doctor's appointments, went supermarket shopping, and assisted in preparing my needed medications. So, thank you once again for your services. On behalf of Lynn's family, we want to thank you and your staff for their consistent, comforting care. She was not easy to deal with, especially when she was resisting her situation. She didn't want to be in an institution and you helped her avoid that. Thanks, again. Thank you for your very professional and supportive response in assisting me. You have provided a competent and capable personal attendant for me who has proved to be very appropriate to support me in those instances where often another hand or separate support is needed. Your assigned helper has been a self-starter and has taken on added tasks which assist me and for which I am thankful. It is apparent that your company is quick, well-organized and efficiently managed. Thank you very much. Always There has been an invaluable service and I am greatly appreciative. You were and are, indeed, Always There to help in difficult and distressing times. I do truly thank you for your services. The "Always There" team of caregivers have provided superior care and assistance for my wife while alive and myself when needed. Their care and thoughtfulness is very much appreciated. I have received nothing but excellent service from Always There. Flexibility and punctuality have been outstanding on every occasion I've had the pleasure to use the Always There service. I highly recommend Always There for those needing additional help at home or with driving or shopping. Thank you for having a caregiver care for our mother in the last week of her life. The caregiver was a wonderful, caring and kind woman who took excellent care of mom, and made her feel loved and safe. Thank you again for sending a caregiver on such short notice to assist me after knee surgery. He arrived each day, he was very pleasant, attentive to all my needs and I felt 100% better after his visit each day. He was not only professional and more than capable of assisting me with all of my medical needs, he was also very intuitive and sensitive to my emotional and sensitive state of mind. I am so happy that I accepted your wise advice to treat myself to some much needed home care after a painful surgery that left me feeling a bit overwhelmed. I would recommend "Always There" home care to all of my loved ones and will be calling again in the future to use your services to help with my Dad or anyone else that I know who needs excellent home care. Thank you again! My husband and I suddenly came down with a horrible stomach flu, at almost the same moment. When I realized how sick we both were, I knew we needed help! I picked up the phone - it was about 10:30pm. Sherri, the Director, answered. She came to my house immediately and had wonderful caregivers here before midnight! The caregiving staff is fantastic! Kind, thoughtful, conscientious, and ready to go above and beyond! I would recommend them as highly as possible! Thank you for providing help and care for my mother and I. Your services made the day easier and the caregiver, in addition to being efficient, was easy to work with. I want to thank you and your staff for your professionalism and sincere caring for my father during his last days of life. A special than you got to Maria, who we met at the worst possible time for our family. She was steadfast in her care and concern for all of us, and helped make my father's last days more tolerable for all of us. My only regret is that we did not begin our relationship sooner. Please accept my thanks for your services following my surgery. I don't think we would have survived without your great help. All the women you sent were thoughtful, caring and efficient and made my recovery much faster. I didn't have to worry about overburdening my husband and actually there were many days when we were both patients. They all seemed to be studying for future education and we were glad to help them as we could. You have a fine staff and we thank them all. I don't know how to thank you for the people and care services that you provided during the past 12 months. When I was referred to you I had already tried private duty nursing and three other agencies with unacceptable poor results. My wife's ALS had degenerated to the point that her care was extremely challenging. You staffed wonderful people. You worked with us to provide the additional training that was required for my wife. You never failed to provide backup when needed, and always accommodated additional shifts when I needed to recharge or needed time to tend to personal needs. The day that I interviewed you, you said that you would "always be there". Frankly, I had heard that three time before. They were always empty words. You were truly "always there" for us. The people that you staffed provided competent, loving care under the most extreme circumstances. You had a very dramatic impact on not only the quality of my wife's life. but on mine as well. Thank you. Last Saturday night after celebrating the 4:30 PM Mass I suffered a medical emergency and hospitalization. I was discharged home from the ICU to a very worried and concerned Parish staff that I should not be left alone in the evenings. After 30 years of giving care, I suddenly found myself in the uncomfortable position of having to ask for care. A referral from a fellow priest in the diocese brought us to Always There, LLC. Your prompt response, followed by your visit, gave me the confidence that I could trust you to bring someone reputable and competent into my home. In Danil I found both. What a wonderful young man! He was punctual, he was friendly yet not overbearing, he was presentable and he followed my directions to a letter. I would find it difficult to find enough superlatives to describe how relieved I was to be in my own bed, in my own home, knowing that Danil was just across the hall should something occur. It brought me the security to finally be able to rest. Although he woke me up three times a night, as we previously agreed, I never felt more rested in the morning. This was miraculous for me and I will be forever grateful to Always There, LLC, to Danni, my gracious caregiver, and to you for your careful supervision. I wish you every success and won't hesitate to contact you should the need ever arise. When my husband and I made the decision to move my elderly parents into our home, we turned to your service, Always There, and from the beginning were impressed with your staff and caregivers. Each caregiver that came to our home during the eight (8) months was empathetic, responsive to my parents' needs and considerate of our lives in our home. When we required more coverage, Always There provided the staffing required, and when we had an occasional concern, Always There provided us with immediate solutions. 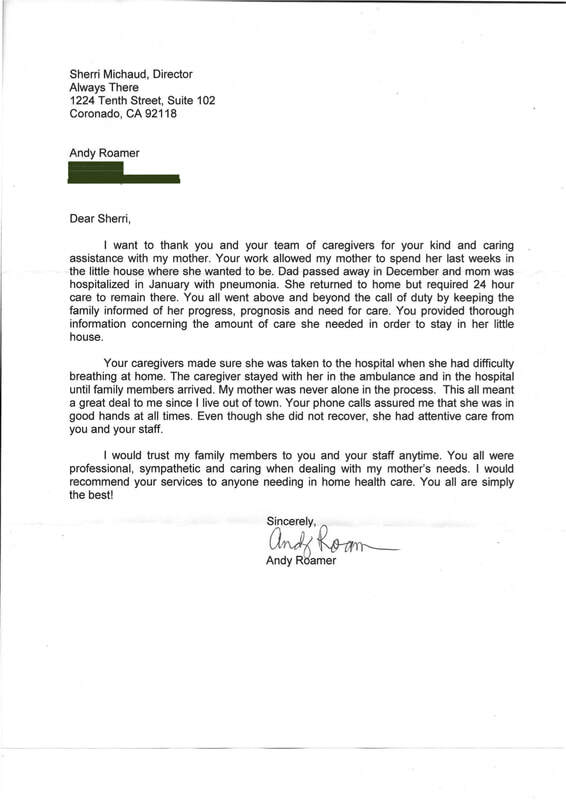 For quality in home care, I would highly recommend Always There. I am so embarrassed that it has taken me so long to send you a note of thanks. We so much appreciated you being willing to accept the oxygen for us and the returning of it! You were a real life savor. It was so nice to meet you. I cannot thank you enough for being always there. I had presence of mind to call you first, you got me to the ER, you stayed with me, saw me safely home, and immediately being taken care of by your round-the-clock caregivers. What a wonderful service! It has been a delight to get to know these young women. Each one so individual, hardworking, and with wonderful dreams of a nursing career. They have the heart for it. They not only helped me heal. They have left me a memory of their precious sweetness that I will never forget. They truly carried out your motto: Prompt, Polite, and Professional. Thanks to you, Sherri and Always There. Thank you, yet again, for not only "being there", but for the wonderful care. Love to all the wonderful workers. Thank you and your fine staff for arranging for my post-surgery health care! If there is ever a moment that makes you realize your vulnerability and fragility it is the combination of post-anesthesia and strong medication. Without the two capable health care workers you arranged for me, I would have been toast. Both caregivers were not only competent and gentle, they are exactly the kind of help you welcome into your home. That kind of trust worthiness is exceptional in this age. So thank you again, Sherri and team Always There, for assuring my rest and re-cooperation. It made all the difference to know that your expert care really is "Always There". This letter has two purpose: to be laudatory and complimentary for the superb services you and your company accorded me on three occasions over the past three months during my recovery at home from serious surgery which required nursing as well as living assistan﻿ce, while﻿ my regular caregiver was absent on longstanding travel commitments. The second purpose is to thank you profusely for making these occasions easy and enjoyable to experience despite some formidable concerns about my specific recuperative needs. The three different caregiver you provided were simply marvelous in every way! They came on time every time and worked diligently throughout each visit. They were never idle or intrusive in any way. I felt completely comfortable with their presence. They willingly and enthusiastically performed any task I requested, always with skill and competence. Despite my considerable physical and medical requirements, they demonstrated very significant nursing and housekeeping skills from delicate, sensitive medical procedures, to pet care and food preparation. They were all self-starters who did recurrent tasks without being asked after an initial occurrence, taking the initiative in a polite helpful way. Not only were they very versatile in their capabilities. They were “always there” when needed. As a result, my solitary periods without family support were pleasant and trouble-free. On one trip to the emergency room when I required a difficult medical procedure that call for materials we did not have at home, not only did the caregiver take me at night, but she stayed with me throughout a prolonged effort to complete the very uncomfortable procedure that ultimately was unsuccessful, then returned with me to complete it to my great relief. It was a tough event for both of us but her support was crucial and “above and beyond” normal expected duties that occurred at off hours and involved significant discomfort on my part and patience on hers. What I would add to the above is my admiration for another characteristic of you and your company. You deliver what you promise and that is a lot. Please accept my Very Well Done! You can be very proud of your staff. Quite simply they are the best. I wanted to thank you for providing such a tremendous service and great caregivers. 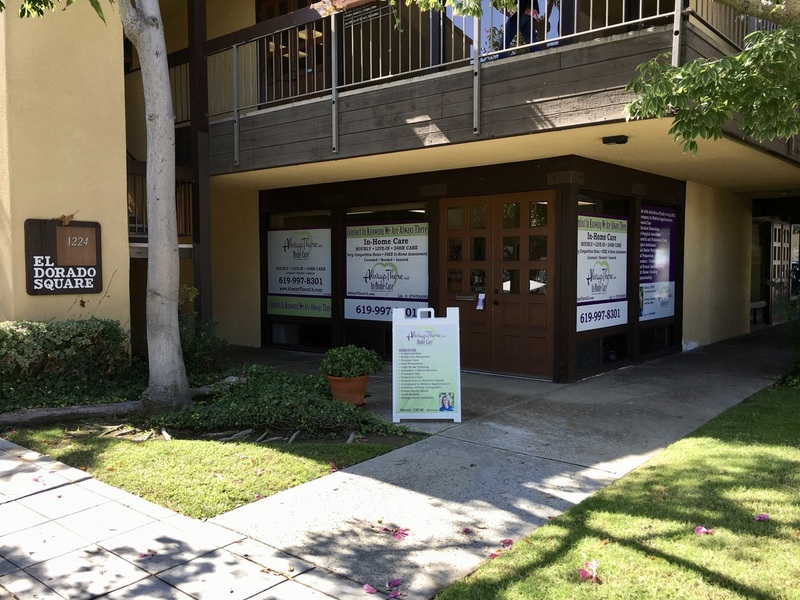 I feel your business is such an asset for Coronado, and I hope it continues to grow by leaps and bounds. You certainly know how to pick the cream of the crop for CNA’s!! I have told many people recently how I felt blessed by God by having so many loving girls taking care of my Mom. "Just met the owner, Sherri, what a warm lady. Very impressed with her professionalism and knowledge." "Dependable, trustworthy, and very professional. Highly recommend." "Thank you so much. You've made a terrible experience not only bearable, but a real pleasure." "Always There is a wonderful service. My mother and I had a great experience with them. They provided companionship, personal care, meal preparation, and driving services while I was away. The ladies were very professional and caring. I would recommend Always There to people who are looking for quality home care." 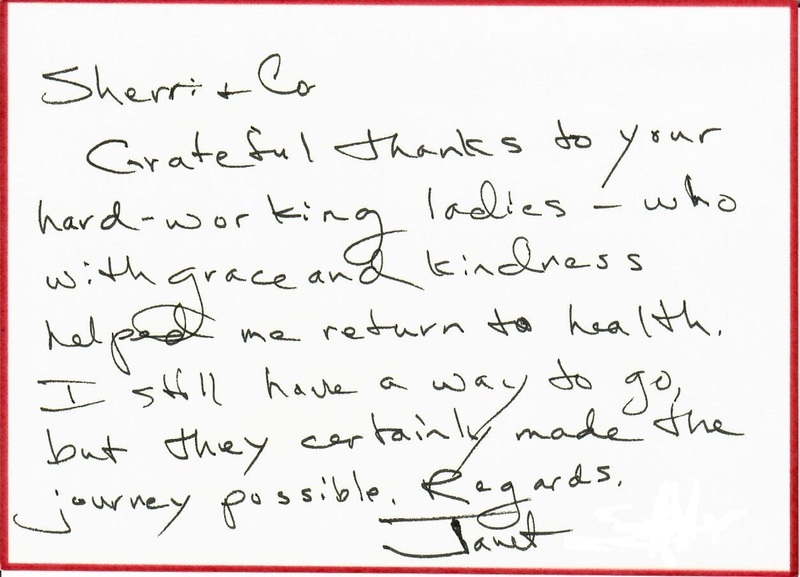 "Recently I had minor outpatient surgery which required assistance. Since I recently relocated on my own from the Midwest, I didn't have anyone to ask help drive me to and from my appointment, along with helping get settled once I arrived home. After some research I contacted Always There to see if they could help. They were more than helpful in setting up a CNA who drove me to and from my appointment along with ensuring I was settled in at my house and well enough to be on my own before leaving. Everything went perfectly and I wouldn't hesitate to recommend or use Always There again! I really appreciate the help they provided me!" "I am so grateful that I have somebody that could help me do things, do them the right way, in an efficient manner and enjoy them. My Caregiver is a God's send, and I don't know what I would do without her. She is so caring and I will recommend her to anybody. This company provided all the services I have been looking for and I'm so thankful that I found them. Always There is a great company. They provided me a great caregiver and couldn't have given me anyone better. Thanks again Always There for always being there for me." "Sherri is a very smart business woman. I wish I would have known about this company a long time ago." "The knowledge, skill, and attentiveness of the caregivers Always There sent to our house was remarkable. When I returned home after surgery, I had no idea of the delicacy or the breadth required of skilled home caregivers. Now, I have the greatest appreciation for Always There's personal interest in each of their patients, assuring very responsible, knowledgeable care, and also that intangible value of a "good fit." Sherri's accompaniment with﻿ ﻿each caregiver to our home for the purpose of making introductions and reviewing instructions to caregivers, in my presence, was particularly helpful." "I'm so glad the Always There caregiver was in our lives. Her presence brought a great deal of comfort to both my parents and offered me a greater piece of mind knowing that she was there. She is a skilled and gracious professional."